Dodgers Blew | American McCarver. Your Sports Blog. So when, exactly, do you give up? When do you tuck your hopes into a small teak box — the one with a little ballerina that spins around when you open it up — and stuff it deep into your sock drawer? When do you hacksaw your dreams into several medium-sized pieces, wrap them in heavy plastic and bury them in the backyard? When do you well and truly call it a day? Until next year, I mean? Out of everybody who writes for this stupid little blog, three are Giants fans (because the Bay Area breeds low moral character), two are Yankees fans (because there is a serious mental health problem in this country), one is a Phillies fan (because somebody has to be) and only myself and Unindicted Co-Conspirator Michaels are stalwart enough to declare allegiance to teams under .500. I’d rather fight than switch! The Dodgers have dropped seven of their last ten games, are in the basement of the NL West — behind the freakin’ Padres — and have the fourth-worst record in all of Major League Baseball. There’s no shortage of excuses, of course — I could list them here, but “suicidal fans” is always the last entry, followed by a gunshot — and what it fundamentally comes down to is that the team just isn’t playing very well. This is a very simple game — you throw the ball, you catch the ball, you hit the ball. Ideally. Often times you manage to do none of those things, but “You sit mired in last place barely winning 40 percent of your games” doesn’t have the same zing. Oh, sure, Matt Kemp is an All-Star, Andre Ethier hit in thirty straight games earlier in the season, and Clayton Kershaw is off to a terrific start and has a batting average that’s worthy of envy. But the team as a whole — the organization as a whole — is steadily going exactly nowhere. Plus, Jonathan Broxton is going to come off the DL at some point, and that’s just going make things worse. Some people will tell you that you never give up, that there’s always hope, that being a true fan means that you believe — down to the last out — that there’s still a chance. But these people are stupid. Being a fan doesn’t mean being divorced from reality. This is not a movie, or if it was, it’s not an inspirational drama. It’s maybe a gross-out comedy. A straight-to-video gross-out comedy. With a lot of groin shots, followed by slide-whistle sound effects. That I’m giving up is going to sound to some like the act of a typical L.A. fan, someone who shows up late in the third and leaves during the seventh-inning stretch to “avoid traffic.” Like someone who puts a Lakers flag on his car during playoffs, but “doesn’t really follow basketball” during the season. Like someone who thinks that, y’know, the puck is… Um. Does L.A. still have a hockey team? Yes? Whatever. But it’s not. I may not have the experience with century-long losing streaks, like my dad does with the Cubs, or friends did with the Red Sox, or Inmate Gruber does with the Yankees (in my mind), but neither is fandom a promise to put on clean white sneakers and down the off-brand Flavor Aid. (It’s all the Dodgers can afford.) The earlier you realize that the team is in deep trouble, the earlier you can start to fix it — change things up, experiment, invite Brad Pitt and Jonah Hill to come by and see what they can do. And no groin shots! 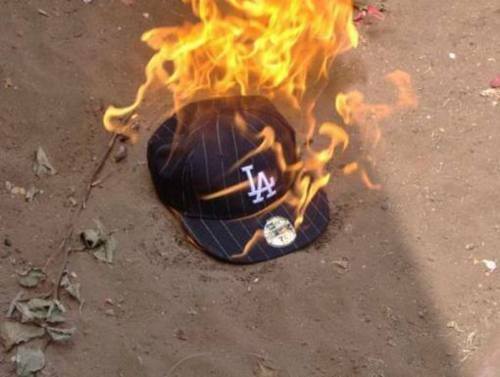 I love the Dodgers, but that doesn’t mean I have to like them. And so… Now what? With the season effectively over, and the hope of the wildest of cards fading into the distance, now what? Crawl back under the covers, and hope for a miracle? Walk away, with our hands over our ears, going “La-la-la-la”? Become really interested in what the local high-school baseball team is doing? Suffer serious head trauma and become Phillies fans? Or just put all our energy into hating the Yankees? I know what my plans are.